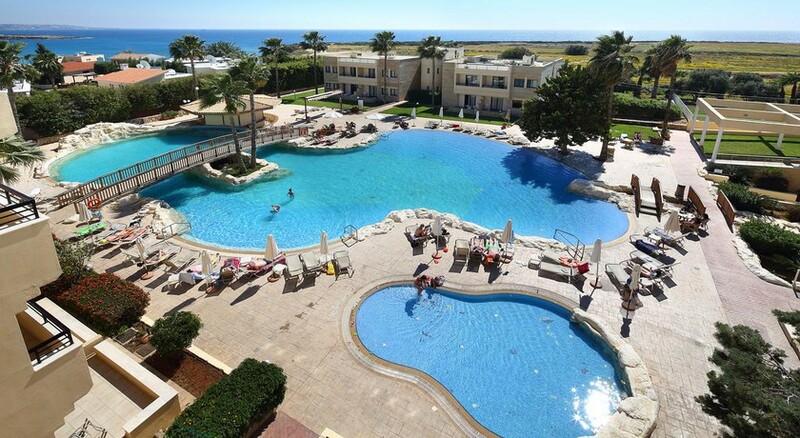 Panareti Coral Bay Resort offers brings its guests a wonderful location as well as a relaxing stay. Guests who stay here will find they have all of the amenities they’ll need. All room types are spacious and comfortable and a pleasure to stay in. Whether you choose an apartment, studio or the villa for a little extra luxury, you will have your own kitchenette and living area, perfect for taking a larger group of family or friends on holiday together. Dine out at one of the many great restaurants and bars, some of which offer views over the Mediterranean Sea. Explore the area and discover some of Cyprus’s rich history at the Paphos District Archaeological Museum, sample fine wine at Fikardos Winery or soak up the rays at one of the nearby beaches. However, you may just want to relax back at the resort, which you can easily do with a massage, in the hot tub or by the pool. Panareti Coral Bay Resort’s beautiful location in Coral Bay, Paphos can be reached in less than 30 minutes from Paphos International Airport. It’s also an easy trip down to the nearest beach from the hotel being a short 250-metre walk. Not only a beautiful location but one that makes accessing amenities such as supermarkets and retail shopping convenient with numerous options within less than a two-mile radius from the resort. There are two amusement parks also nearby. The main hub for restaurants and can be found along Coral Bay Avenue, less than a five-minute car journey, however, there are also a few located closer to the coast or on the various beaches themselves. 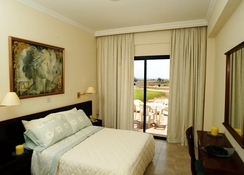 Guests can expect a stay at Panareti Coral Bay Resort to be a clean and comfortable experience. Each room is designed with light, neutral tones and all come fully-furnished with essential amenities such as air-conditioning, wi-fi, private bathroom, safe deposit box and much more. The resort offers several room types: one and two-bedroom apartments, studios and villas. All room types come with a kitchenette and a living area, making Panareti Coral Bay Resort a great choice for a larger family or friends getaway spot. The three bedroom villa comes with its own private pool, patio, barbecue and beautiful sea view. The main restaurant at Panareti Coral Bay Resort serves both local and international dishes and is well catered for children too. Guests will also find a snack bar for something a little lighter as well as an onsite bar. Around the resort, there’s no shortage of more great places to wine and dine. Late night drinks can be found at several popular bars, including the Frog and Toad and Renegades Sports Bar. Chalkies Bar and the Coral Bay West Bar both sit right on the beach and afford diners incredible views over the Mediterranean Sea. Local restaurants cover a range of local and international cuisines, from Greek and Cypriot to Japanese and Italian as well as the freshest seafood. There’s plenty going on at Panareti Coral Bay Resort to keep guests active and entertained. Guests may simply want to enjoy one of the swimming pools or grab a sun lounger and soak up some of that Cypriot sun on the terrace. The hot tub, jacuzzi and massage make for great ways to rest and relax. Alternatively, stay active at the tennis court and fitness centre. Children will love the outdoor play equipment and their own swimming pool. Away from the resort, learn about the area’s rich history at the Paphos District Archaeological Museum, taste some exceptional Cypriot wine and Fikardos Winery or visit the historic and beautiful Saint Neophytos Monastery. Free cancellation allowed up to 7 days prior to arrival.